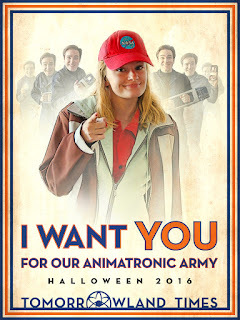 Join Our Animatronic Army this Halloween! 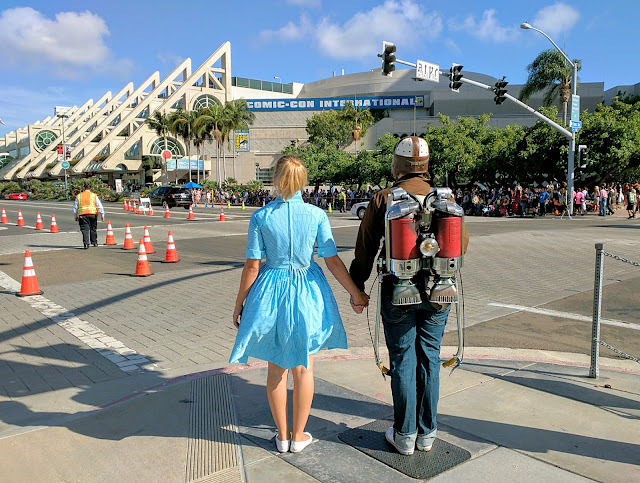 In an effort to showcase a new Tomorrowland-inspired cosplay annually, this Halloween our Athena will be making her debut as Casey Newton, with our Frank playing the antagonist as one of Governor Nix's nefarious audio-animatronics, Dave Clark. 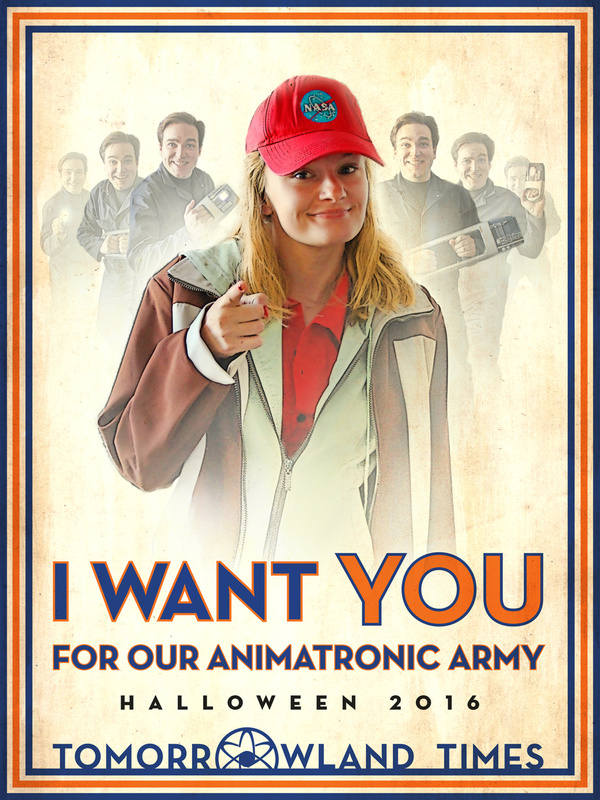 We thought it would be fun to extend an invitation to all of our fellow Dreamers this Halloween: Join our Dave Clark Army! Our personal Tomorrowland collection includes two screen-used Dave Clark jumpsuits from the production of the film (one of which is currently available in the Tomorrowland Times Anniversary Sale, if you're in the market) and it occurred to us that this could be a very easy and inexpensive cosplay for fans to put together, with a high level of accuracy. THE JUMPSUIT: The only truly essential item of this costume is the jumpsuit. The production used a pair of off-the-shelf coveralls made by Red Kap. The exact style is their Men's Twill Action Back Coverall, in the charcoal color. Thankfully, this identical garment can be purchased on Amazon. 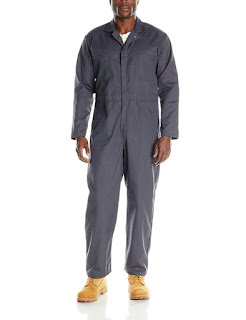 The only modifications the production made to the off-the-shelf jumpsuit were the insertion of shoulder pads, the back pleats sewed shut, and slight tailoring of the legs at the inseam. If you're feeling ambitious, you can make these modifications, but the unmodified garment works just as well. THE BELT: The original costumes in our collection did not include the screen-used belts (we're still on the lookout!) but based on screen reference, I'm 99% sure they used a tactical belt made by Uncle Mike's Law Enforcement. 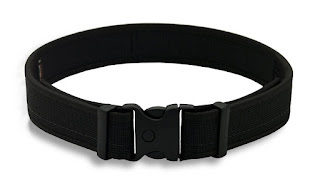 (This links to the Amazon listing for convenience, but the belt may be found at a discount elsewhere.) Alternatively, any large black belt would work just as well. Feel free to customize, as the different Dave Clarks in the film had various sized pouches slid onto the belt. THE SHIRT: The undershirts worn by the Dave Clarks in the film were a designer mock turtleneck from Patrick Assaraf, into which the production sewed a back zipper, as they often do for makeup purposes. I haven't been able to find any listings for this shirt online, but any dark gray or black mock turtleneck will work just as well. (Or even a high-collared dark t-shirt.) For the purposes of staying cool, you may even want to consider a mock turtleneck dickie! THE SHOES: We haven't yet identified the screen-used, laceless black boots, but considering they fall beneath the hem of the coverall legs, any black shoe will do. THE TEETH: This isn't so much a costume consideration, but it proper Dave Clark fashion, be sure to show those chompers -- the more maniacal the smile, the better. To accompany the costume, we decided to make a Dave Clark blaster prop replica. While we can't offer additional replicas for sale, the makers among you can 3D-print your very own Dave Clark blaster with this free 3D model! That's it! The beauty of this costume is that, even going all out, it can be done for well under $100. (Not something you can say often for a screen-accurate cosplay.) Using items you already own -- or scouring your local thrift store -- along with the jumpsuit, and you'll be hunting Frank Walker for under $50! Let us know if you'll be making your own Dave Clark costume, and be sure to share your Halloween photos! I have never gone to a comic con before though i do want to go to one, and your outfit choice is very easy but it gets the point across! I love the subtlety about it.